This report plots the iostat output contained in file: iozone_w_iostat_sda1.out. It contains a series of plots of the output from iostat that was captured. The report is contained in a subdirectory HTML_REPORT. In that directory you will find a file name report.html. Just open that file in a browser and you will see the plots. Please note that all plots are referenced to the beginning time of the iostat run. IOstat outputs a number of basic system parameters when it creates the output. These parameters are listed below. The iostat run was started on 02/03/2013 at 17:29:24 PM. Below are hyperlinks to various plots within the report. This figure plots three types of CPU Utilization: (1) User, (2) System, and (3) Nice. The User utilization is the percentage of CPU utilization that occurred while executing at the user level (applications).The System utilization is the percentage of CPU utilization that occurred while executing at the system level (kernel). The third time is the Nice utilization which is the percentage of CPU utilization that occurred while executing at the user level with nice priority. This is the percentage of time that the CPU or CPUs were idle during which the system had an outstanding disk device I/O request. This is the percentage of time spent in involuntary wait by the virtual CPU or CPUs while the hypervisor was servicing another virtual processor. This is the percentage of time that the CPU or CPUs were idle and the system did not have an outstanding disk I/O request. This figure has two parts. The top graph plots the Read Rate in MB/s versus time and the bottom graph plots the Total CPU Utilization percentage (User Time + System Time). This figure has two parts. The top graph plots the Write Rate in MB/s versus time and the bottom graph plots the Total CPU Utilization percentage (User Time + System Time). This figure has three parts. 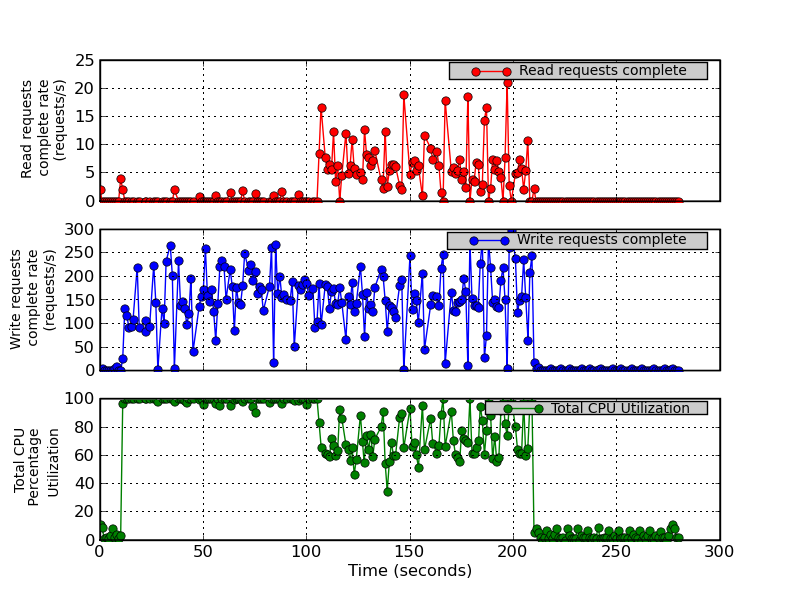 The top graph plots the number (after merges) of read requests completed per second for the device versus time. 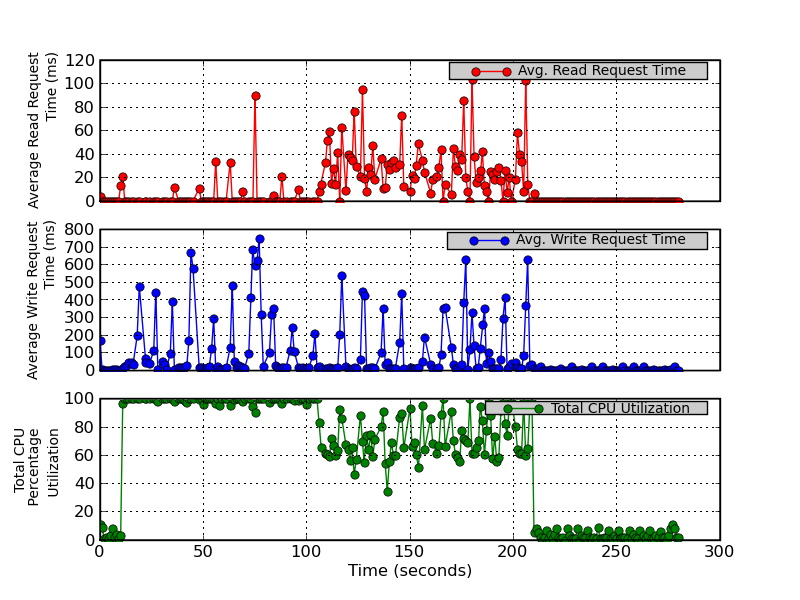 The middle graph plots the number (after merges) of write requests completed per second for the device versus time. 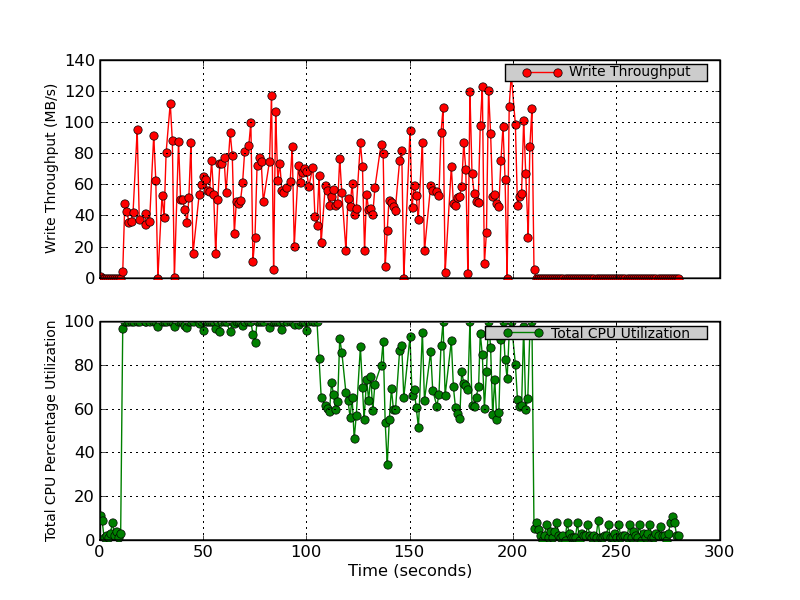 The bottom graph plots the Total CPU Utilization percentage (User Time + System Time). This figure has three parts. 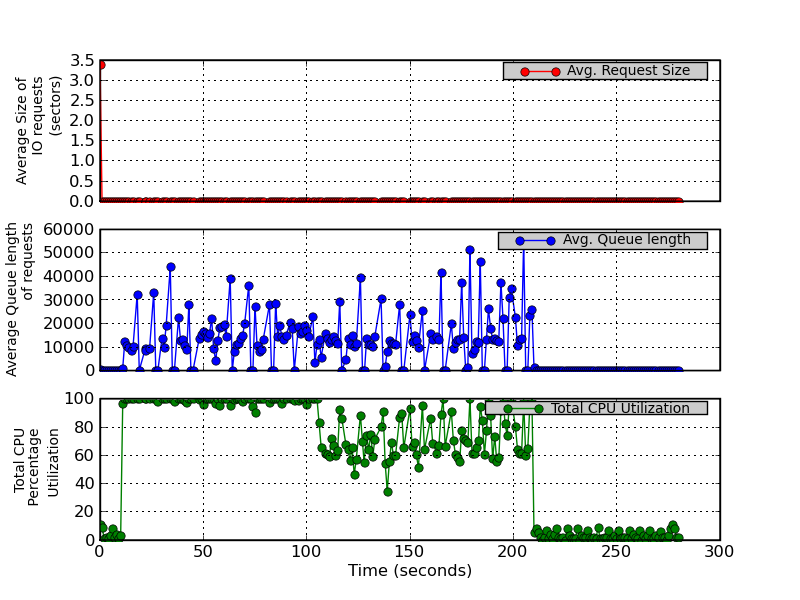 The top graph plots the number of read requests merged per second that were queued to the device. The middle graph plots the number of write requests merged per second that were queued to the device. 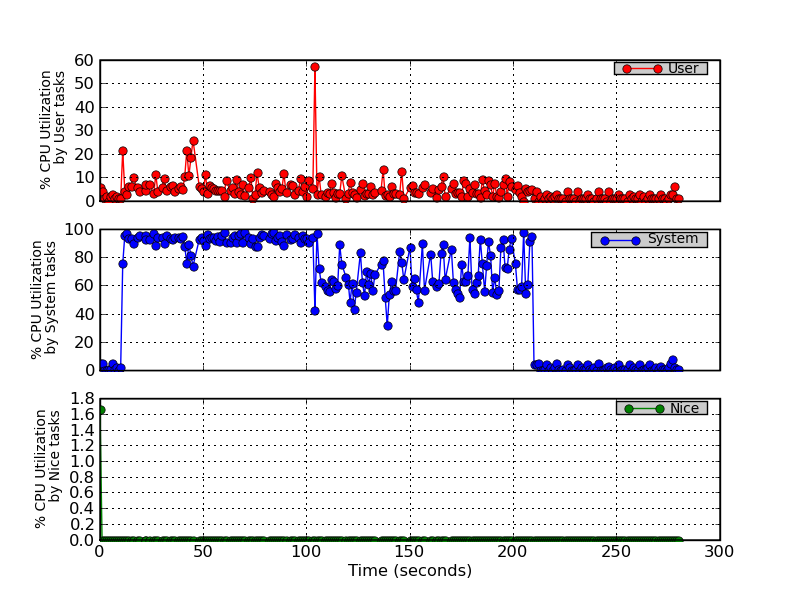 The bottom graph plots the Total CPU Utilization percentage (User Time + System Time). This figure has three parts. The top graph plots the average size (in sectors) of the requests that were issued to the device. 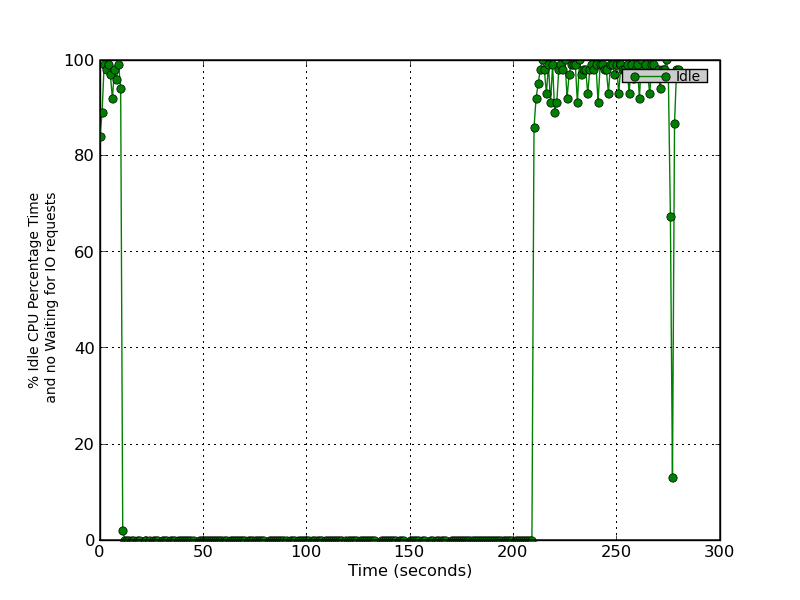 The middle graph plots the average queue length of the requests that were issued to the device. 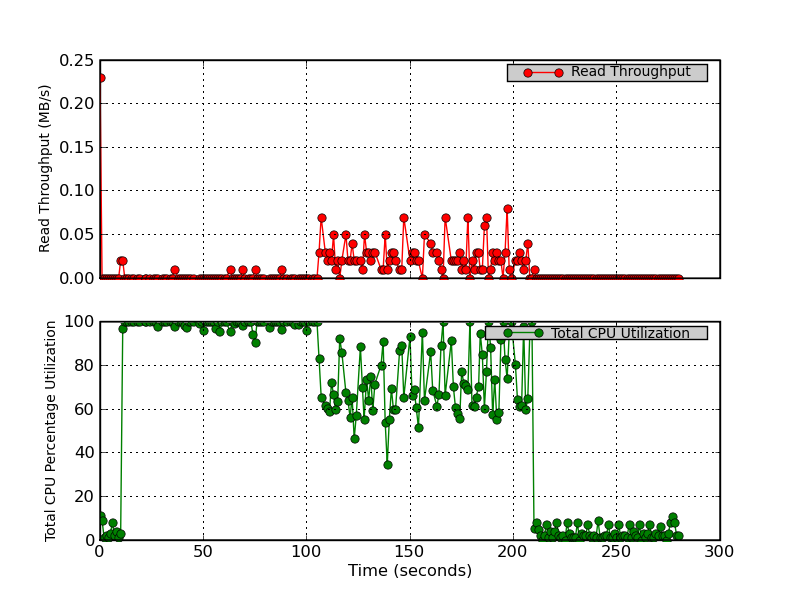 The bottom graph plots the Total CPU Utilization percentage (User Time + System Time). This figure has three parts. 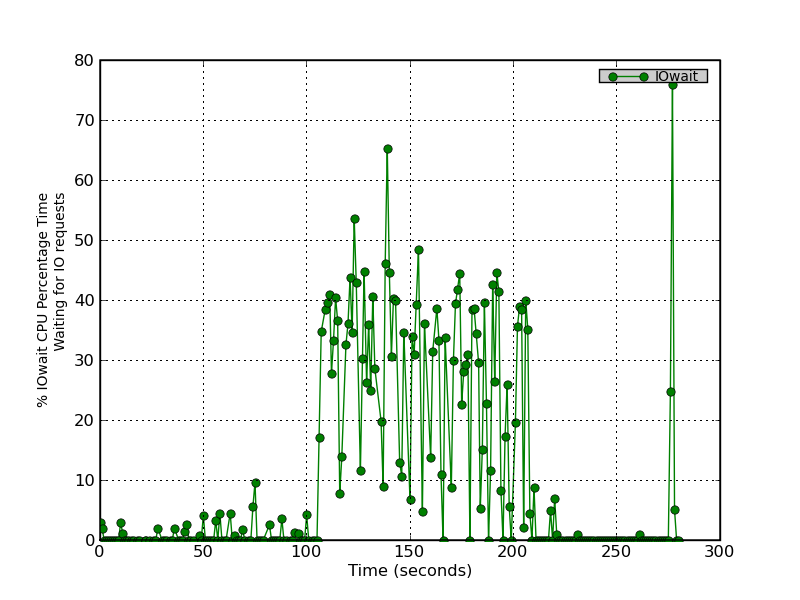 The top graph plots the average time (in milliseconds) for read requests issued to the device to be served. This includes the time spent by the requests in queue and the time spent servicing them. 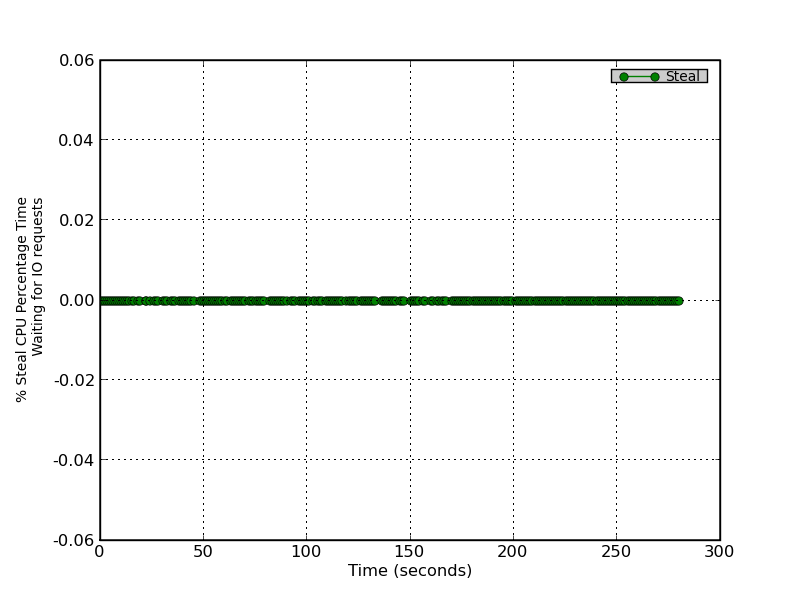 The middle graph plots the average time (in milliseconds) for write requests issued to the device to be served. This includes the time spent by the requests in queue and the time spent servicing them. The bottom graph plots the Total CPU Utilization percentage (User Time + System Time). This figure has two parts. The top graph plots the percentage of CPU time during which I/O requests were issued to the device (bandwidth utilization for the device). Device saturation occurs when this value is close to 100%. 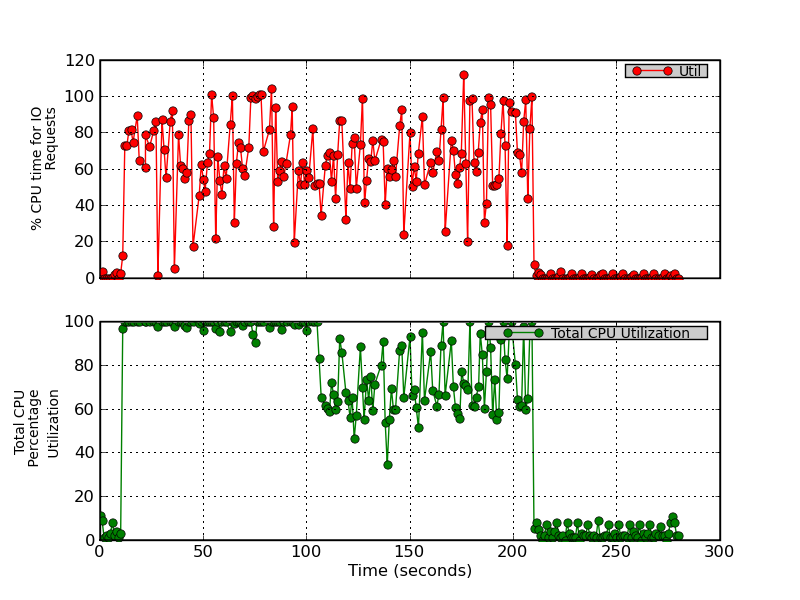 The bottom graph plots the Total CPU Utilization percentage (User Time + System Time).